If you're a woman of color suffering from dark spots and hyperpigmentation, there are plenty of skin care products designed to even your skin tone, allowing you to always put your best face forward. Traditional lightening products contain hydroquinone, but there are gentler alternatives, such as vitamin C and kojic acid, that will also even out discoloration with minimal side effects. 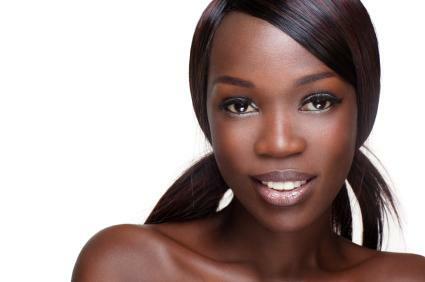 It's important to treat African American skin gently in order to avoid any additional damage or discoloration. Traditional ways to even skin tone, including micro-dermabrasian treatments and chemical peels, may be too harsh for black skin and can cause further hyperpigmentation. Whether you're looking to give an overall even look to your complexion or target specific discolored areas, there are a number of different products that will leave your face uniform and glowing. Ambi Fade Cream comes in two formulas - one for normal and one for oily skin types - and helps fade dark marks and discoloration with a two percent concentration of hydroquinone. The hydroquinone is combined with vitamin E to moisturize and soften and a blend of alpha hydroxy acids to slough off dead skin cells and enhance results. Results can be seen in as little as two weeks, and once your desired skin tone is achieved, you can stop using the product. Even True Tonecorrect Fade Creme helps banish hyperpigmentation and discoloration by using a two percent concentration of hydroquinone, while natural peptides and citrus extracts and other natural ingredients soothe the skin and help prevent excessive dryness and irritation. Palmer's Skin Success Eventone Fade Milk helps fade dark spots on the face and body, while moisturizers soften and smooth skin to prevent dryness and ashiness. The formula uses alpha hydroxy acids to slough off dead, uneven skin cells, and vitamins C and E to further brighten and protect. Eventone Fade Milk should be applied to discolored areas twice a day for optimal results. Whether you have a few spots you're looking to lighten or your complexion needs an even-toned overhaul, products to even the skin tone can help bring your skin back into balance and create a radiant, healthy look.